"I'm having a love affair," our cousin Motti confides, "with ghosts." It's a pitch-black night but artificial light glows on the walls of Jerusalem's Old City just beyond us. Motti's current , favored ghost is Theodore Herzl who is considered the founder of modern Zionism and thus, of Israel. "He is so relevant to our lives," Motti says. "Herzl changed the course of history, and once in a while, it's worth it to consult with him. Human nature doesn't change, anti-Semitism hasn't changed. It's the same script, the same theater, so why not consult with the director? He's there." In 1895 Herzl wrote Der Judenstaat, ("The Jewish State") a book that asserted Jews were never really safe from anti-Semitism wherever they lived and the only solution was for them to remove themselves from the Diaspora and establish their own state. He died nine years later, in 1904, having visited Palestine only once. "He worked himself to death," Motti says. "He was a dreamer, but first and foremost, it was his honesty and integrity that was an atomic force that demolished all obstacles. Herzl made us think about ourselves as a nation, not as a community." There's no better place to indulge ghostly love affairs than Israel: it offers a wide array of ghosts to choose from; you don't have to limit yourself to just one; and it's perfectly fine if others are having an affair with that same ghost. In fact, even better - then you can compare notes, which is what we're doing the following day at an event in honor of the 50th anniversary of the death of my husband's great-grandfather, the former chief rabbi of Jerusalem. On a hilltop overlooking Jerusalem, my oldest son, David, and I join a horde of the rabbi's descendants, many of whom are clad in the long-black coats, pants and black hats that indicate their status as ultra-Orthodox Jews. The men gather around the grave, swaying and bowing as they say Psalms in Hebrew. Afterward, we sit in a synagogue in the Old City where various people who knew their grandfather or great-grandfather offer words and memories in honor of him. For a few moments, the ghost comes to life as a man of Torah and of principle who also sought, religiously, to keep the Jewish people united. Personally, one of my favorite ghosts is one I was introduced to as a child, learning Bible stories at home and in church: King David. Over the years, I've come to understand him as more than simply a "man of God," and as a far more complicated man with big dreams: to unite the individual tribes under one rule and create the first Jewish monarchy in Israel. According to II Samuel, David conquered Zion and created "the city of David," which is where I'm walking this unseasonably warm, winter day, the day before Hanukkah. 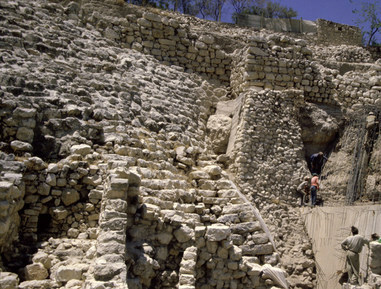 Archaeologists have been excavating parts of the City of David for the past century and most recently, archaeologist Eilat Mazar claims to have uncovered what she believes to be King David's palace, described also in the book of II Samuel. The massive boulders below me, which Mazar terms the "Large Stone Structure" and which date to the 12th or 11th centuries BCE, around the time of King David's rule, don't appear to be anything but more stone walls in a city of ancient stone walls. However, whether Mazar's assertion that these are the remains of King David's palace proves to be true or not, it's magical to walk in these dusty pathways just below Mount Moriah and imagine a kingdom being shaped and formed thousands of years ago, right here. Up north in the Golan Heights, I'm not expecting to encounter ghosts, but in the car with our cousin Dov at the wheel, he points up to a hill where some small stones houses are perched and he says, "In 1967, I was in the paratroopers, and two other guys and I were in one of those houses. We were watching the Syrians with our telescope, and they were watching us with theirs." Dov goes on to recall the Yom Kippur War of 1973 and how, by chance, he happened not to be in the country when the war broke out. His troop was in the Suez Canal at the time and instead of lying on the beach and getting a suntan, which they had joked they'd be doing, many, including a very close friend, were killed. For a small country, a lot of ghosts, ancient and not so ancient, are packed within its borders, and the living and those who are gone at times seem equally at hand. Like the stones that have been used and re-used, from the Canaanite times to Herodian times, through the Ottomans and the British, the past and the present co-mingle. On one of my last days in Israel, when I enter Jerusalem, I note the big encampment outside of Prime Minister Benjamin Netanyahu's home. Inside are Noam and Avivah Shalit, parents of Gilad Shalit, a soldier who was captured 4 ½ years ago in Gaza by Hamas. They've been sitting in the two tents, accepting visitors, as a sit-in protest of the government for not doing enough to get their son back. A huge sign with a picture of Gilad Shalit and the Hebrew words addressed to Netanyahu and his wife, "Sarah and Bibi, I've been alone for almost 1,609 days. And where are you?!" is prominently placed in full view of all who drive past. 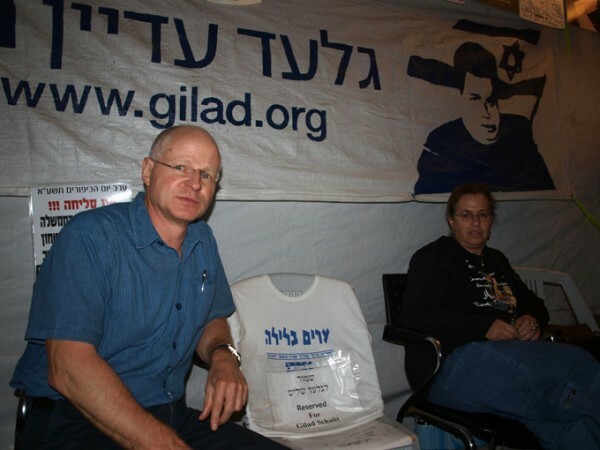 An unoccupied chair, "Reserved for Gilad Shalit" sits in the tent. After ten days of ghost stories - of old, wise rabbis; of dead and captured soldiers; of legendary leaders, modern and ancient - I board the El Al plane to return to America. In the entrance is an electric menorah on which five candles are lit up for the fifth day of Hanukkah. Throughout the week, I've lit the Hanukkah candles and made the blessings with various cousins and eaten potato pancakes and jelly doughnuts, in recognition of the "miracle" that happened in the 3rd century BCE, when a small band of Jews, the Maccabees, overpowered the mighty Greek force that was ruling the country, and relit the eternal flame in the Temple, re-establishing Jewish rule for the second time. The airplane lifts off, leaving behind Israel, which came to life first under King David, then under the Maccabees, and most recently, after almost 2,000 years as an empty chair that was waiting to be filled, spurred by the dreams of Herzl.